The NFL has only made players take the field for the national anthem since 2009, and The Washington Post reports that policy could soon be overturned. 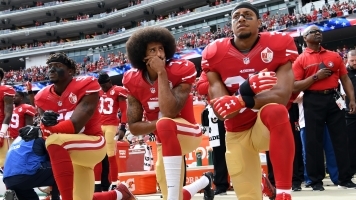 The NFL may have found a way to end player protests during the national anthem: keeping them in the locker room while the song plays. No formal proposals have been confirmed yet, but several sources told The Washington Post the idea would likely be discussed if protests continue. The history of NFL players taking the field during the anthem isn't a very long one. Players have only been required to do so since 2009, and they still don't have to stand for the anthem. NFL spokesman Brian McCarthy told Snopes that players used to stay in their locker rooms for "The Star-Spangled Banner" during primetime games due to "network timing issues." And the practice doesn't appear to be associated with the other displays of patriotism at sporting events paid for by the military. According to a report by Sens. John McCain and Jeff Flake, since 2012 the Department of Defense has paid the NFL and other sports leagues millions of dollars for those displays in the hopes of boosting military recruitment. Some teams have already stayed in their lockers rooms during the anthem as a form of protest this year, but no one's been punished for it. The annual league meeting will take place in March of next year, and that's where potential policy changes would likely be discussed.